I was out at San Nicolas Island on the Peace one day. It was a warm clear November day and fairly calm. We were heading towards the east end of the island and had already dropped of about 8 halibut hunters that were going to catch up with us. We anchored on the inner edge of a large kelp bed. Most of the rest of the divers were going to head in and west to look for bugs. I was going to do something unusual. In the past 10 years, I had rarely used a speargun. I am good with a pole spear and with the proper tip, I could take what I wanted. I had also not taken much in the way of Sheepshead either. They were getting uncommon and I had already taken my share. Well, I decided that this time I was going to take 6 of them, because that is what it takes to fill my smoker. I wanted some smoked fish and you are more likely to find large fish at San Nicolas than anywhere else. I do not pay all that much attention to all the place names, but I remember that someone had called this Shark Point. I hopped in with the large 3 band arbaelet that I had borrowed from Don. I have no idea where my big gun had gone to in the years that I was diving up north. I was hoping that I was still a good shot. I went on into the kelp bed at about 40 feet. It was a thick bed and it was very dim under it. I was staying in the passages on the bottom. It was a nice rocky reef and I had my eyes open for any stray antennas when I saw a nice 12 or 14 pound Sheepshead. That was what I wanted so I shot it in the head. It was a longer than average shot and I still seemed to be able to hit my fish. I used to be really good, back when I used a gun regularly. Anyway, I was kneeling on a rock, putting the fish in the bag when I saw a large tail flash by at the edge of my vision. I thought 'cool, Yellowtail'. I loaded up my spear and cocked it, then took off in the direction that the fish had been going. I actually figured that if it was a Yellowtail, it was probably a half mile away by now, but lets find out. I was going north west. I came to a sorta open spot and there in the kelp were these 5 big fish. Unfortunately, they were blue, not yellow. That is to say that they were 5 to 7 foot Blue Sharks. Been there, done that. I wasn't going to smoke them, so I went the other way. I shot another Sheepshead and came upon another group of about 7 large sharks. Change course, shoot Sheepshead, go on to the next sharks. All in all, I found about 8 groups of 4 to 9 rather large Blue Sharks each. They were everywhere I went in the kelp bed. It may have been a bit indiscreet, but I just kept shooten away, though when I did find the groups, I left. At one point, there was a nice, about 10 pound Sheepshead that I was lining up on, but it was literally surrounded by 5 big blues. Oh well, I guess that was the one that got away... or maybe I do have some small bit of discretion. I got my 6 Sheepshead. I did scope out some of the blues a bit. Interesting. It would have been nice to have had a camera. They never seemed to pay much attention to me during the dive, but I did not invite attention either. I have never seen more than a couple of Blue Sharks on a dive, before or since. That was a pretty sharky dive. The Picture? Later that day, I saw something new. 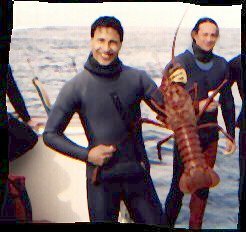 How exactly he did it, I am not sure, but Joe Cavillo took a 10 pound Halibut, a 7 pound Yellowtail and this 7 pound bug... in one dive. Now these do not ordinarily get found together. Whatever he did, I guess that it was a good idea. Actually, as some people know, Joe is a consistently good hunter. ... I dunno, Joe says it was someone else... I did hear that Michael Roach managed to get all three in one dive once, but, you know Michael Roach ... Mr. Submarine.